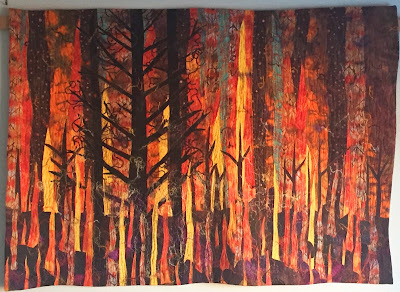 She Quilts It: Heat Wave - Final - "SCORCHED FOREST"
Wonderful! As I mentioned before, the colors are so vibrant! Wow! I can almost feel the heat of the fire from here! This quilt just sizzles! I found this posting while looking for elements to design a t-shirt for a friend who asked me to produce something for his small team of scientists who are currently helping battle all the wildfires up here in the northwest. 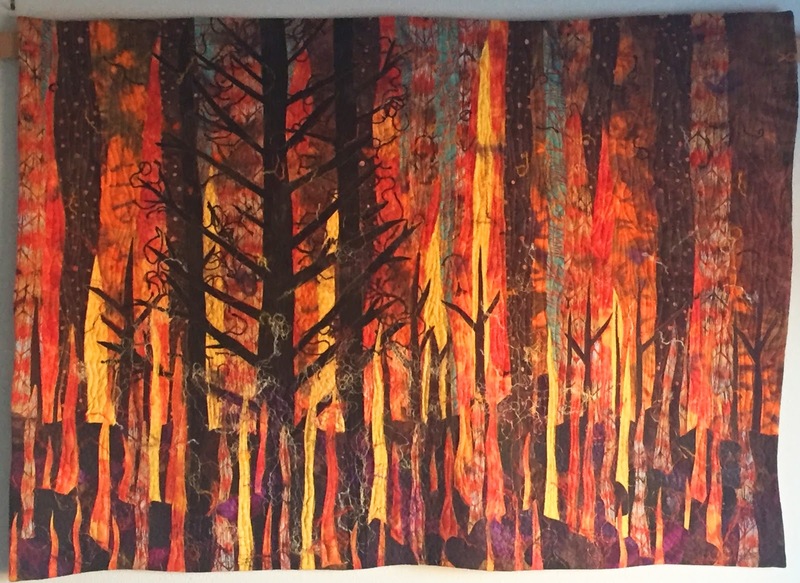 Quite frankly there is nothing more engaging and powerful than the "Scorched Forest" quilt you're showing here. It really is just perfect and blows me away. And, I must say that I've also looked at much of your other work and it's all lovely. You are an amazing artist! I wonder if you'd allow us to use "Scorched Forest" for the t-shirts? It won't be to make money, at all. I'm even volunteering my time. It's just a way for this group to rally around what they're doing and cultivate a team vibe. What they've requested from me is to find an image, like yours, and then at the bottom place in one long sentence: "Fifty Shades of Ash" that will fade into a gradation and disappear. I'm mentioning that in case you're not into that saying and don't want your work associated with that. I would totally get it if you are not into letting us use your work and/or if that saying offends you because of the movie/book it’s associated with. The scientists involved just thought it was a good pun for what they’re dealing with. In any case, thank you for considering this request and, like I said, amazing work!